(Silver Spring, Md. )- After the success of the network's breakout hit ODDITIES, SCIENCE moves its popular franchise to the West Coast with the world premiere of ODDITIES: SAN FRANCISCO. SCIENCE expands its empire of the eccentric to the epicenter of all things strange at San Francisco's famed Haight Street. There at the infamous antiques shop, Loved to Death, the cabinets of curiosities overflow with bizarre taxidermy, memento Mori Jewelry and art pieces that epitomize the macabre and mysterious. 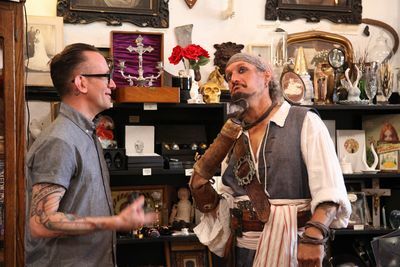 SCIENCE kicks off a summer of new shows with the world premiere of the all-new six-part series, ODDITIES: SAN FRANCISCO on Saturday, June 23 at 9PM (ET/PT). "At SCIENCE, one of our goals has been to 'own weird'- and in the process, ODDITIES has become a cornerstone franchise for the network," said Debbie Adler Myers, general manager and executive vice president for SCIENCE. "Viewers were vocal that they wanted more access into this signature subculture, so we're going to give it to them. We're taking the genre to the next level by introducing an entirely new look into this fascinating and hugely entertaining world. 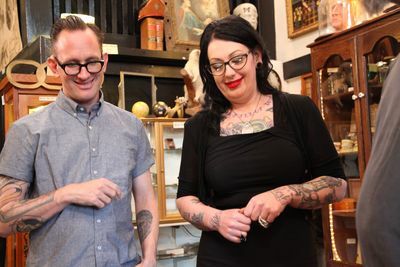 ODDITIES fans are going to love ODDITIES: SAN FRANCISCO." Guided by Loved to Death store owner Audra, and sales associates Wednesday and Korri, audiences will meet wonderfully weird characters with wacky items to sell and even stranger tales to tell. 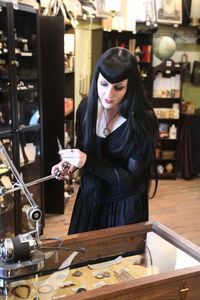 From human tooth jewelry, Odd Fellows' hoodwinks, antique resuscitation valves, Victorian tear catchers, and beyond, there's something uncommon for everyone available at this unconventional establishment. 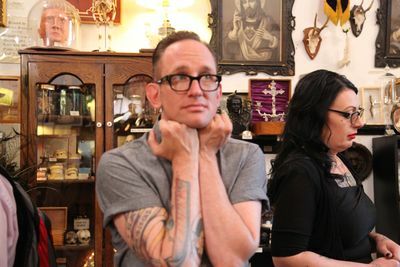 Featuring six all-new episodes, ODDITIES: SAN FRANCISCO airs Saturdays this summer beginning June 23 at 9PM (ET/PT). ODDITIES: SAN FRANCISCO and ODDITIES are produced for SCIENCE by Leftfield Pictures. Brent Montgomery, David George and Shawn Witt are executive producers for Leftfield Pictures. At SCIENCE, Bernadette McDaid is vice president of production, McDaid and Josh Berkley are executive producers and Lindsey Foster is producer. A patron tries to sell the shop real human tattooed skin and injects new life into what it means to be a pin-up girl. Then, a retired organ grinder enlists Audra & Korri's services to find an item that brings him back to yesteryear. During the search, they get bowled over by a real life bone collector whose basement is an over the top ossuary. Later, an unusual performing couple introduces Wednesday to "mental floss" while seeking new props for their gross-out act. A local artist recruits Wednesday to hunt down a working vintage automaton in order to inspire a whale of a kinetic sculpture. Her gears are sent spinning when she uncovers an eclectic troupe of misfit robots and a headless scribe. Then, Audra and Korri get "lucky" when they are invited to explore the depths of the local San Francisco Odd Fellows lodge. After some shocking discoveries, they stumble upon a friendly face . . . made of real human hair. Later, an imbiber of human fluids tries to sell off one of his favorite cannibal utensils. A fashion designer needs macabre objects and a living subject to dress up her new clothing line's photo shoot. With the help of a local gaff-maker, Wednesday & Korri rush to the rescue, putting their heads together to come up with a picture perfect solution. Then, Audra takes a business gamble and buys what could be an antique prototype diving helmet. It's sink or swim as she ventures to a nautical expert to get her underwater treasure verified. Later, a bizarre busker wanders in with a jar full of mystifying animal remains that could spell legal trouble for the shop. Audra & Wednesday are transported back to the Victorian era when a steampunk Major hires the shop to seek hunting trophies for his Exploratorium. Gears are cranked and teeth are pulled as the shop's team struggles to come up with a find fit enough for a house literally on wheels. Then, a customer attempts to sell a calf head with a lot more on its mind than milk. Later, Audra & Korri buy antique drug paraphernalia from a sideshow performer who in return, sets the roof on fire...with his mouth. A customer stops in the shop to sell Wednesday a gas mask that's a horse of a different color. Then, a local eccentric collector commissions Audra to craft him a most unusual diorama in exchange for an item that simply takes her breath away. Taxidermy and biological weapons collide when Wednesday heads to market. Later, Audra & Korri enlist an expert to discover the identity of a mysterious skull and spine brought in by an even more mysterious green suited man. At Loved to Death, an eccentric magician gives Korri and Audra an unforgettable assignment--find him a serpentine oddity worthy of his act. Audra must help Korri overcome an intense fear of snakes, while the duo searches for the remains of one of the deadliest specimens known to man. Then, Wednesday makes a trade that earns her a tour of a twisted sideshow collection. When she discovers a live electric chair, she realizes there is only one way to make sure it's the real thing. Later, an eccentric customer reveals just how many legs it takes to sell a cow.